You won’t believe what happened! My human went out and got her usual from the burger joint down the street — a fried egg sandwich with avocado. But when she unwrapped it, she found out that they had put bacon in it! As many of you know, my human does not eat bacon. She does not eat four-legged things at all. 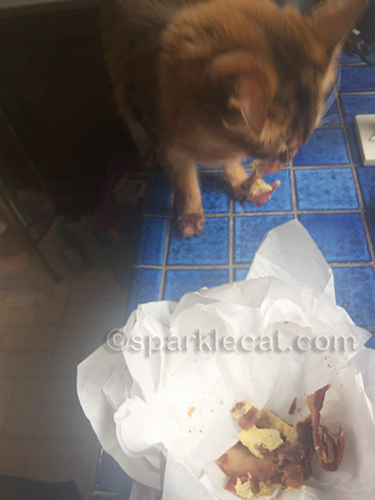 She thought it would be silly to go back and return it, though, so she just took out the bacon… and saved it for me! I wanted to eat all of it… but my human wouldn’t let me. 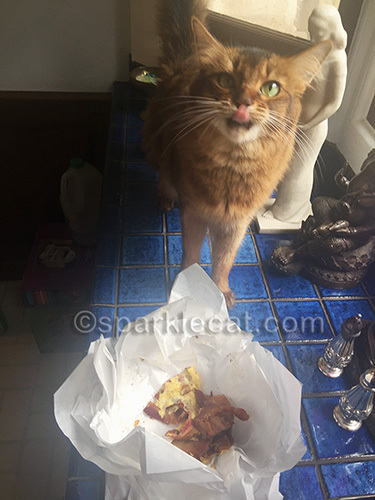 She said that was too much bacon for one little cat. Yes, I had to do some tricks, but it was totally worth it. It was like getting a bonus treat instead of the usual freeze dried chicken! 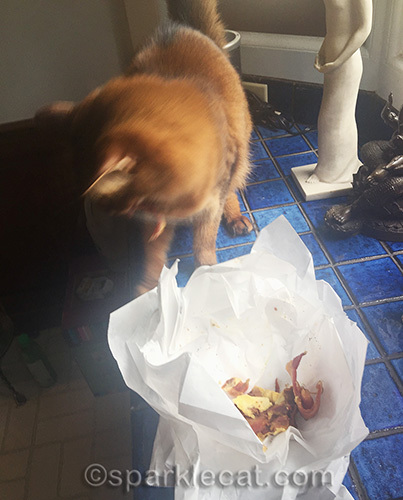 I will confess… I did try to steal some of the bacon and run off with it. But don’t tell anyone, okay? Did you share your bacon wif Boodie anâ€™ Bing-Binga? oh yum, my girls would also say “lucky me” if they could have all the bacon they want! I give them a share of mine (because unlike your human I do eat bacon). Lucky you, so glad you got a special treat. Bacon is the hip, new meat. It’s in almost everything these days! How wonderful that your momma shared it with you. How excited you look! Kitty Cats look very cute, when they look surprised! Oh boy! You’re so lucky! We don’t get bacon in this house, either. Mommy will eat meat occasionally, but never a pig. OH BOY!!!!! LUCKY YOU!!!!!! I’m with Spitty – there absolutely is no such thing as “too much bacon” !! Wow, this was your lucky day Summer! But what does she mean, “Too much bacon”? I do not understand the meaning of that. What a lucky mistake for you! My humans eat bacon a few times a year and they’ve offered me some, but I’ve never actually tasted it. I’m sorry.. what does it mean: “too much bacon”?? That doesn’t even make sense! Glad you got some of it, if not all! All the bacons, that’s what we want, ALL, that’s not too much to ask for! Good for you for stealing it! hee hee! We won’t tell, Summer. Promise! Oh, and good for you, getting that delicious bacon! Serendipity!!! Bacon right in your furry own den! OMC!!! Glad you got to taste it! It was fun seeing you get all ‘stealy/snitchy’! That was lucky for you! TBT eats bacon, but only when he makes breakfast, which isnt often (he usually just goes straight to lunch). 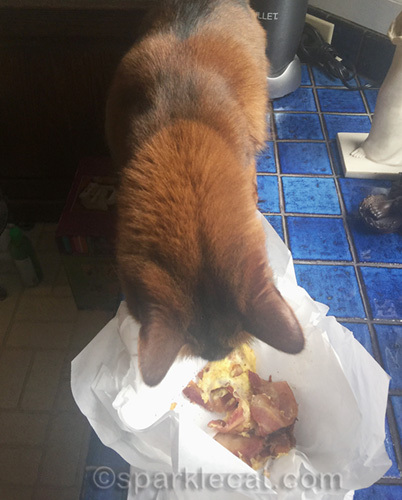 So we get bits of bacon sometimes and we get to lick eggy bacony plates too. 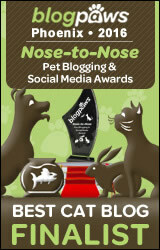 PeeS: We saw your comment that your human just got her return filed Monday because of a late K1. She always files early so we bet that was stressful for her to wait on it. We hope she gets that K1 sooner next year! That is quite the bonus for you Summer! We would have grabbed that and ran too! 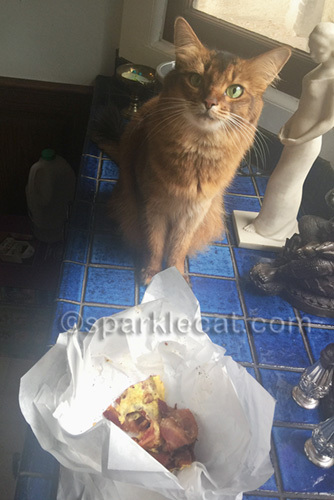 That was nice of your human to overlook the “order error” and to let you have the bacon, Summer. Can you believe none of us have tasted bacon? Not even the dogs! Surprise bacon?? We say you’re the lucky one, Summer! Were trying to picture dainty Summer stealing bacon and running off with it. Good thing you didn’t. It would ruin our mental image of you. 🙂 Seriously, you sure got a treat. That’s a LOT of bacon! The one time TW got some by mistake, I wouldn’t go near it. I don’t blame you for trying to run off with some bacon. Such a treat doesn’t come every day. Wow! Bacon? You are one lucky kitty. That looks really yummy. I’m glad that you got the opportunity to have such a tasty treat. My kitties love bacon too. They can’t resist it! That was a mistake that worked out VERY well in your favor!!! * helpless giggles * OH Summer you little monkey!!! That was a very lucky mistake for you. My mum very rarely has bacon so that means I hardly ever get it. SCORE! Did she at least save the rest for a LATER treat time? Wow, that’s a great way for the mistake to turn out — your bacon! I’m actually glad to know that bacon is OK for kitties. I wasn’t sure but my girls sure love it when I have it for breakfast and now I know I can share. That was definitely your lucky day. Oh Summer! What a great mistake that was!!! Man they don’t come any better! Oh you lucky girl! Mom shared a tiny bit of her burger at dinner last night, but I would’ve rathered bacon! Num num. 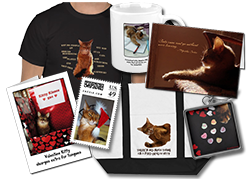 It was good of your Mom only to give you small amount ’cause bacon is salty & too much salt is bad for we kitties. Looking pretty you are, as always! Not all mistakes are bad. Glad you got a bonus. MOL Summer truth be told you called in that order w extra bacon Right? Lucky you! Maybe the burger place put the bacon for you on purpose 🙂 Love the photo of you about to eat it! Wow, Bacon, good score Summer. Bet it was tasty. We have never had any bacon. Such a nice mistake and bonus for you pretty Summer! my motto has long been everything tastes better with bacon on it. Summer…you scored! Do you know we’ve never had bacon? We’re so deprived. Wow, Summer! That is a seriously cool thing to have happen to you! Bacon is so delicious!!! Man, you lucked out, seriously. We get fried chick-hen but never had bacon. Wow, what good luck! We will never tell!